SQL Server databases are critical workloads that require a low recovery point objective (RPO) and long-term retention. 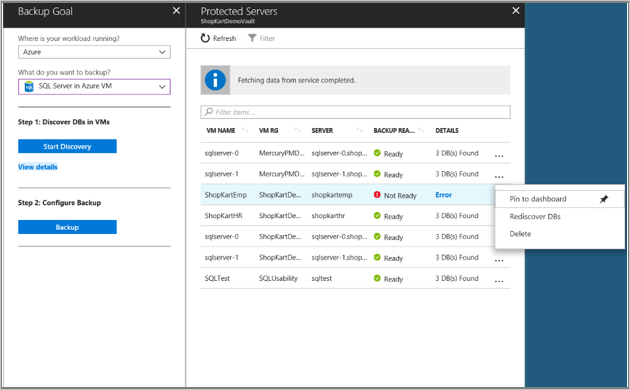 You can back up SQL Server databases running on Azure VMs using Azure Backup. This solution leverages the SQL native APIs to take backups of your SQL databases. 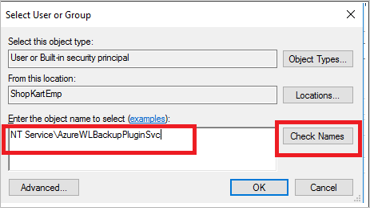 Once you specify the SQL Server VM that you want to protect and query for the databases in it, Azure Backup service will install a workload backup extension on the VM by the name AzureBackupWindowsWorkload extension. This extension consists of a coordinator and a SQL plugin. While the coordinator is responsible for triggering workflows for various operations like configure backup, backup and restore, the plugin is responsible for actual data flow. To be able to discover databases on this VM, Azure Backup creates the account NT SERVICE\AzureWLBackupPluginSvc. This account is used for backup and restore and requires SQL sysadmin permissions. 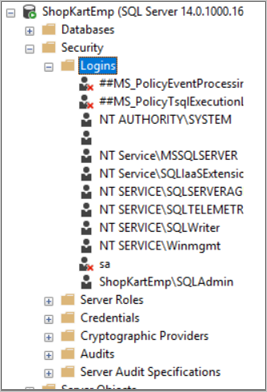 Azure Backup leverages the NT AUTHORITY\SYSTEM account for database discovery/inquiry, so this account need to be a public login on SQL. If you didn't create the SQL Server VM from the Azure Marketplace, you might receive an error UserErrorSQLNoSysadminMembership. If this occurs follow these instructions. At the scheduled time, the coordinator communicates with the plugin and it starts streaming the backup data from the SQL server using VDI. The plugin sends the data directly to the recovery services vault, thus eliminating the need for a staging location. The data is encrypted and stored by the Azure Backup service in storage accounts. When the data transfer is complete, coordinator confirms the commit with the backup service. Make sure you have a SQL Server instance running in Azure. You can quickly create a SQL Server instance in the marketplace. Review the feature consideration and scenario support. Review common questions about this scenario. Supported deployments SQL Marketplace Azure VMs and non-Marketplace (SQL Server manually installed) VMs are supported. Supported SQL Server versions SQL Server 2017; SQL Server 2016, SQL Server 2014, SQL Server 2012. Enterprise, Standard, Web, Developer, Express. SQL Server backup can be configured in the Azure portal or PowerShell. We do not support CLI. The solution is supported on both kinds of deployments - Azure Resource Manager VMs and classic VMs. VM running SQL Server requires internet connectivity to access Azure public IP addresses. SQL Server Failover Cluster Instance (FCI) and SQL Server Always on Failover Cluster Instance are not supported. Back up and restore operations for mirror databases and database snapshots aren't supported. Using more than one backup solutions to back up your standalone SQL Server instance or SQL Always on availability group may lead to backup failure; refrain from doing so. Backing up two nodes of an availability group individually with same or different solutions, may also lead to backup failure. Databases with large number of files can't be protected. The maximum number of files that is supported is ~1000. You can back up to ~2000 SQL Server databases in a vault. You can create multiple vaults in case you have a greater number of databases. You can configure backup for up to 50 databases in one go; this restriction helps optimize backup loads. We support databases up to 2TB in size; for sizes greater than that, performance issues may come up. To have a sense of as to how many databases can be protected per server, we need to consider factors such as bandwidth, VM size, backup frequency, database size, etc. We are working on a planner that would help you calculate these numbers on you own. We will be publishing it shortly. In case of availability groups, backups are taken from the different nodes based on a few factors. The backup behavior for an availability group is summarized below. It is recommended that the backup is configured on only one node of an AG. Backup should always be configured in the same region as the primary node. In other words, you always need the primary node to be present in the region in which you are configuring backup. If all the nodes of the AG are in the same region in which the backup is configured, there isn’t any concern. Regardless of the backup preference, backups won’t happen from the nodes that are not in the same region where the backup is configured. This is because the cross-region backups are not supported. If you have only 2 nodes and the secondary node is in the other region; in this case, the backups will continue to happen from primary node (unless your backup preference is ‘secondary only’). If a fail-over happens to a region different than the one in which the backup is configured, backups would fail on the nodes in the failed-over region. Depending on the backup preference and backups types (full/differential/log/copy-only full), backups are taken from a particular node (primary/secondary). Use an account with SQL Server sysadmin permissions to sign in to SQL Server Management Studio (SSMS). Unless you need special permissions, Windows authentication should work. 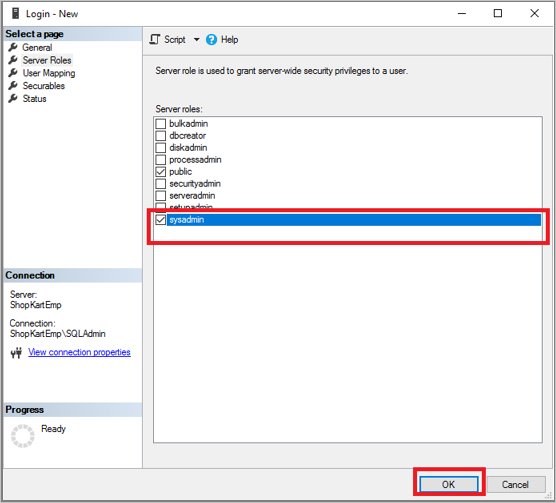 On the SQL Server, open the Security/Logins folder. Right-click the Logins folder and select New Login. In Login - New, select Search. The Windows virtual service account NT SERVICE\AzureWLBackupPluginSvc was created during the virtual machine registration and SQL discovery phase. Enter the account name as shown in Enter the object name to select. Select Check Names to resolve the name. Click OK. In Server Roles, make sure the sysadmin role is selected. Click OK. The required permissions should now exist. Now associate the database with the Recovery Services vault. 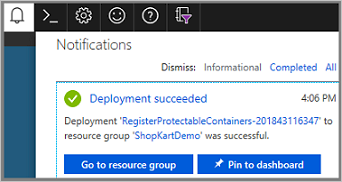 In the Azure portal, in the Protected Servers list, right-click the server that's in an error state > Rediscover DBs. Check progress in the Notifications area. When the selected databases are found, a success message appears. Learn about backing up SQL Server databases. Learn about restoring backed up SQL Server databases. Learn about managing backed up SQL Server databases.